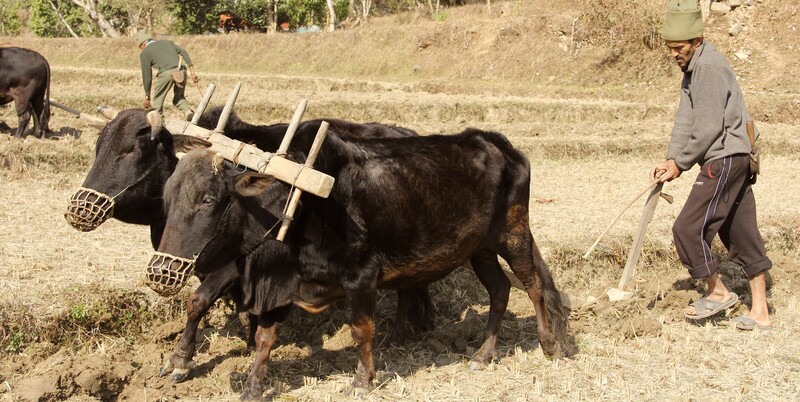 Household incomes of around 50 cents per day, coupled with time-consuming and physically demanding farm labor, give many families in Gorkha no chance to break from the cycle of subsistence farming. Not only are they struggling to put food on the table year in, year out; they also have no means of overcoming the situation to create a better future for themselves and their children. Most are too poor to qualify for a bank loan, so the Gorkha Foundation gives microcredit – tiny loans – to mothers in some of Nepal’s poorest villages. We choose to loan to women groups to compensate for the overwhelming gender discrimination seen in the patriarchal Nepali society, plus interestingly enough, women are generally more reliable at managing these loans that the village menfolk. Our experience has shown that groups of women display more cohesion, longevity and dedication to seeing the projects through. Men are, of course, indirect beneficiaries of these loans – they just are not in charge of the purse strings. The loans allow women to form small businesses or increase their smallholdings (with the purchase of animals or seeds, or even fabric for handicrafts etc. ), to generate income, provide food for their children and send them to school. We also deliver crucial training in literacy and successful business practices to ensure that these women can grow in awareness and competence in the marketplace. Newfound self-sufficiency allows them to carve out a better life for themselves and for their children, and these micro-improvements seen at the family level eventually have a positive effect on the macro-communities of the district as a whole. The microcredit program was initiated with the Gift of Goats project in 2005, where the foundation worked with village chairmen to identify the poorest of the poor villagers to be recipients of two goats. The first village was Boharagaun in Lig Lig. Since then we have expanded the program to three more villages in Lig Lig and four others in Rautepani, Bandanda, Deurali, Malatigaira. 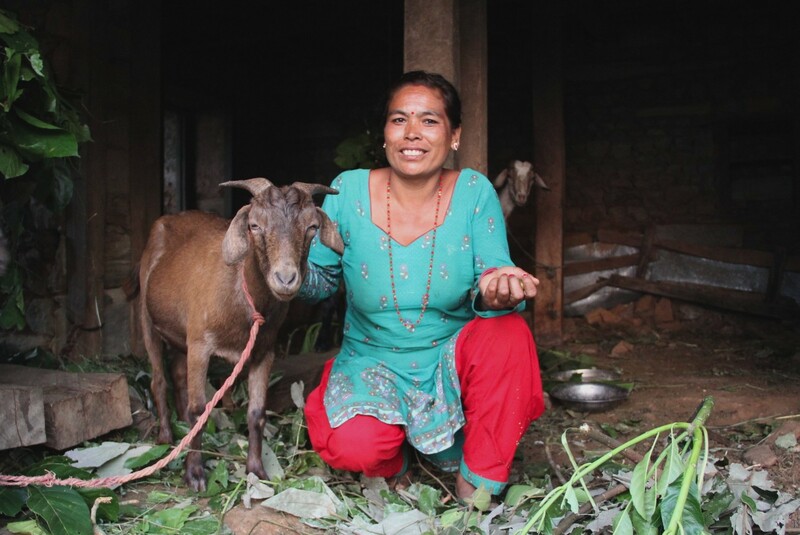 Following the success of the Gift of Goats project, Gorkha Foundation implemented microcredit as a way of supporting more families and nurturing more sustainable growth and independence among these communities. We started the program in the same Boharagaun village and expanded to villages all over western Gorkha. Since 2007, when the foundation first provided microcredit to women in Gorkha, we have enabled 2000 women to form small businesses in goat, pig, chicken and buffalo farming, beekeeping, handicrafts and other enterprises. Microcredit helps poor people overcome poverty. It’s a small loan – often less than $150 per person – to those too poor to qualify for bank financing. Unlike a handout, microcredit helps people become self-sufficient to generate their own income. A loan goes to a group of co-signers, typically a ‘village mother’s group’ (The foundation requires that our borrowers be mothers or caregivers of small children – at least one child must be age 10 or under), with the village chairman or the school principal becoming a trustee of the group. Although each woman forms her own business, they repay loans as a group, at meetings held approximately every two weeks. During the loan term, the women receive services including literacy training, small business counseling and other support to ensure their success. The loan term is typically short: a year with Gorkha Foundation and typically with other microcredit organizations; and the interest rate is 3.5 % rather than those higher rates demanded by unscrupulous personal moneylenders, who can charge as much as 30%. After paying off their initial loans, the groups often pool savings, making loans themselves to members who expand their businesses or buy a home. Gorkha Foundation then ‘recycles’ repayments, including interest, to form new groups of borrowers. Microcredit enjoys a huge ripple effect. Not only do the loans break the cycle of poverty in households and villages, but according to the World Bank and other sources, the investments that women micro-entrepreneurs make for their families later spark sweeping changes in the community. This includes bigger incomes — 50% higher than in other villages — and improvements to literacy rates, nutritional health, school enrollment and contraceptive use, to name but a few. Taju Maya Rana Mughar, a pig farmer from Kuraini, took a loan of NPR 150,000 in 2015 to expand her family’s smallholding. 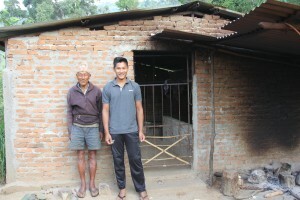 The family (her husband and son, pictured) have just finished construction of a brick pig house to enlarge their production capacity from 6 to 30 animals when fully operational. They sell pork at the market for NPR 300 per kg, with a full size adult pig growing to between 80 and 100kg. Parbati Shresta is part of a collective of 28 women from Bandanda village who have taken a group microcredit loan from the Gorkha Foundation. 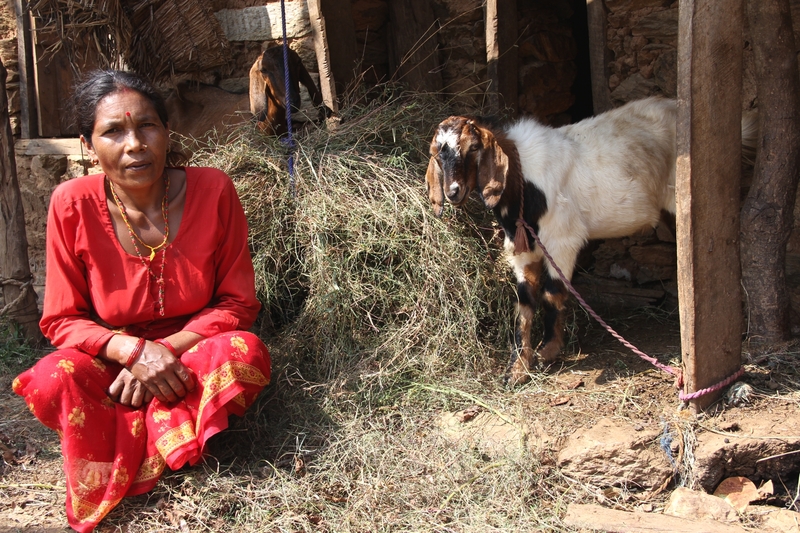 Shresta started her enterprise with 4 goats, and has sold 8 in the 3 years since first joining the scheme. She generates around NPR 25,000 a year, which has meant she can send her daughter to school in Kathmandu. Ratna Kumari Bishow Karma, from Boharagaun is part of another women’s group who has made use of a joint microcredit loan with literacy and business training. She has sold 9 goats over the past 2.5 years, generating income of NPR 40,000, which she has used to send her children to school.